Global Indian for Bharat Vikas (GIBV) is very happy to congratulate Shri Narendra Modi on leading BJP and NDA a to unprecedented and historical victory in the recently concluded national elections of India. This election has far reaching consequences for India and the world. After 30 long years, era of coalition politics has come to an end. A stable government where BJP has clear majority will be able to take critical decisions without succumbing to pressures from small regional parties with narrow interests. India has huge potential for development. It has rich natural resources and largest population of people under age 35. Shri Narendra Modi is capable of unleashing this potential and harnessing energy of the youth and employing it for all round progress. Another salient point of this election is end of dynastic rule of Nehru-Gandhi family. Congress, led by this family forever has been reduced to a paltry 44 seats, failing the minimum threshold to qualify for leader of opposition in the Loksabha. Most of its ministers and seasoned members have lost spectacularly. Shri Modi had promised Congress Mukta Bharat and the process has begun. Congress has failed to win a single seat in seven states and has not been able to cross double digit in any state. Disintegration of Congress is now only a matter of time. From BJP’s tally in UP and Bihar, it is clear that people have voted crossing barriers of caste and religion and in favor of development and stability. Decimation of BSP and SP in their bastion points to the beginning of the end of caste driven politics. As a matter of fact thousands of migrant workers and employees of major corporations in Gujarat who hail from UP, Bihar and Odisha and have experienced benefits of Gujarat model firsthand became brand ambassador for Shri Narendra Modi in their respective states. Under Shri Narendra Modi’s leadership, we look forward to a time when India will lead the world, not as a superpower but as a cultural Guru, where age old and time tested ethos of Vasudhaiv Kutumbakam (The whole universe is a family) and Sarve Bhavantu Sukhinah (May all be happy) will lead to an era of cooperation instead of conflict and nations would compete to provide better living conditions to their citizens instead of stockpiling weapons in a game of one-upmanship. Congratulations are also in order to the voters of India. They voted in big numbers. They voted judiciously and decisively. They voted for better future. This exhibits maturity of Indian electorate. 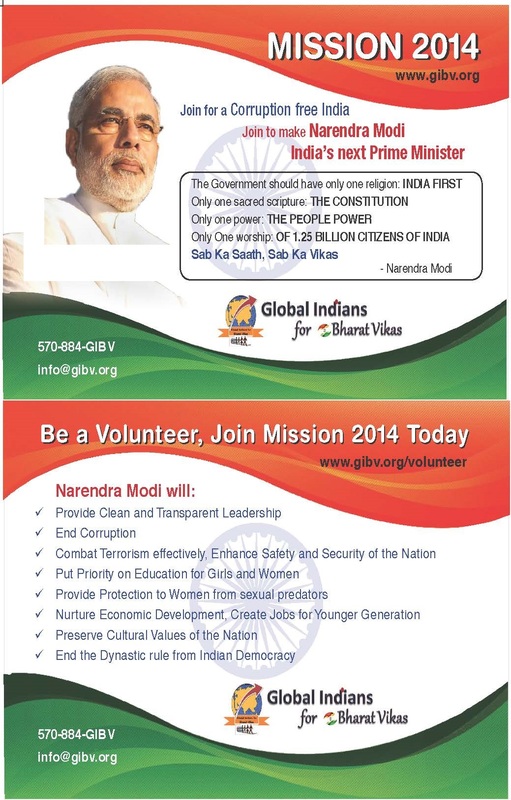 We at Global Indians for Bharat Vikas, a USA based international organization interested in the long term development of India with a Nationalist government at the helm are proud to have 1000+ volunteers across the globe who helped Shri Modi’s campaign in different ways. We will continue to help a government headed by Shri Narendra Modi by providing critical input on issues of importance to the nation. We wish Narendrabhai Modi grand success as he sets out to tackle seemingly insurmountable problems of a weak economy, all pervading corruption, stagnant job market, instability, terrorism, etc. We feel proud that a giant of a Man , a visionary and a nationalist is going to be sworn in as the Prime Minister of India within a few days. Indeed, Better Days are Ahead. (for photos, see Facebook page of <vicharak1>. We spent several days going door-to-door and also addressing groups of villagers in several villages in Varanasi Loksabha constituency. There were several teams covering different villages. Girishbhai Gandhi (Florida) and I were paired together and we would have a local volunteer from the area to be visited accompany us everyday. We had worked out with a car rental company so every morning a car would be available though the driver would be different. As decided from the beginning we did not solicit any funds from the party. Ours was an independent effort augmenting BJP’s campaign and was supported by our own funds. In one village we came across a strong AAP supporter. This was a Kurmi Patel. Many of these Patels are supporting BJP. He had choice words for system failure and had reasons to support AAP, whom he thought had solutions to his problems. We had a lively discussion but we had to keep it to the level where he could understand what a vote to AAP would mean. In our visit to Bakhariya, Kakarahiya, Korauti,, Kotawa, Sirasa, and Rohaniya villages, we were accompanied by two women teachers- Puja Singh and Meena Singh. They were M.A,, B.Eds and quite progressive though in their own home and village they had to be in ghunghat (veil.) We came to know more about the village life, plight of the girls, poor standard of education, etc. from them. They had voted for SP in the last election and were now ruing their decision. Now they were part of BJP’s Women’s wing. We also had interaction with pro-BJP Muslims in the village of Kotawa. This village had seen an inter-Muslim disturbance the day before we visited it. It so happened that some Muslim office bearers of BJP from other states had come to campaign in this town. There was a deputy minister for minority affairs from Chhattisgarh, Salim Ansari. Then there was Ashfaq Patel, president of BJP Minority Cell, Nagpur. His wife, Jaitunbi Ansari is Deputy Mayor of Nagpur Municipality. While they were distributing the leaflets, they were attacked by local Muslims; reason given was that the leaflets were printed in the holy language, Urdu and when these leaflets were strewn around in the street, it was an insult to the Urdu. However, real reason was the fact that there were Muslims who were favoring BJP. Police had to intervene and next day there was a flag march to ward off any potential trouble. We met with the visiting delegation and pro-BJP supporters from the town. Fortunately, by this time a truce had been reached but media was there to interview people to provide fodder to their communal mill. It was an interesting experience to sit down with the Muslims and listen to them. It was also good to see that some educated Muslims have started to come out of the ghetto mentality. 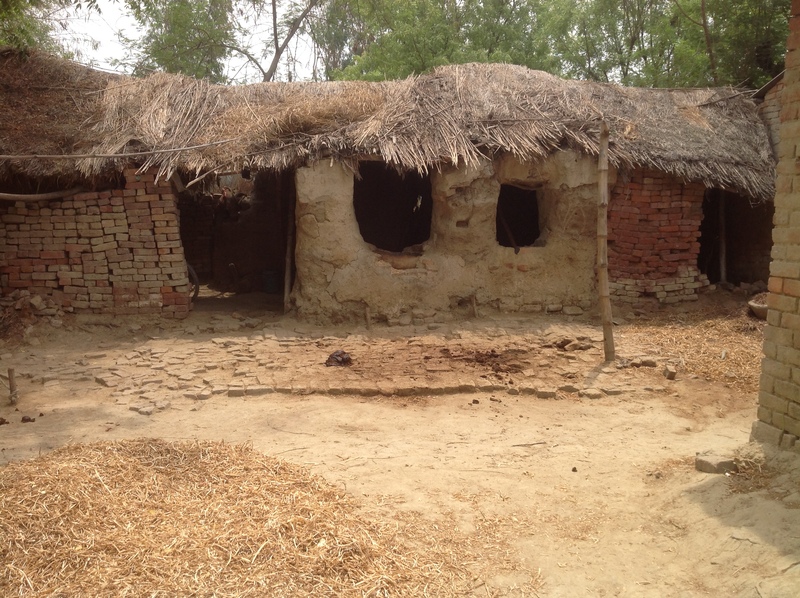 At Kabirpur village the audience consisted of about 20 women; they were not farmers. They complained bitterly about not having water for their children. 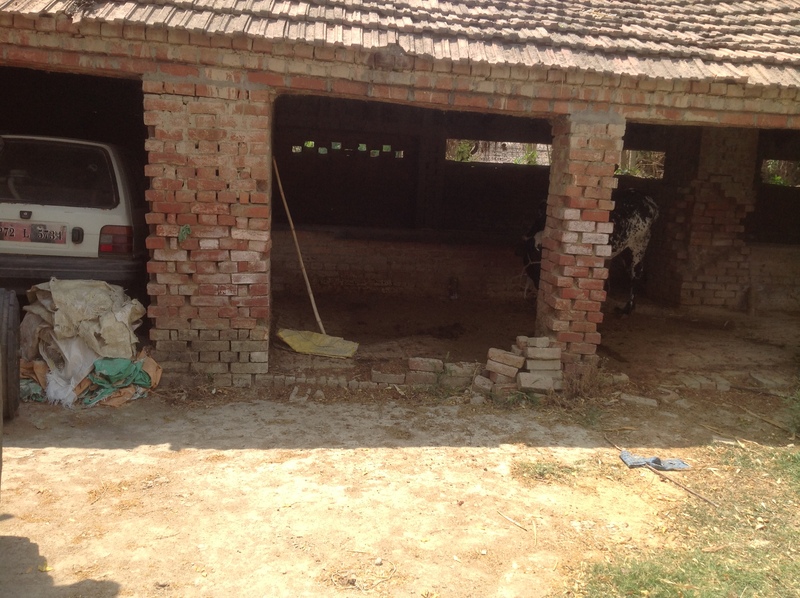 Village had only one hand pump which was installed near village head’s home. 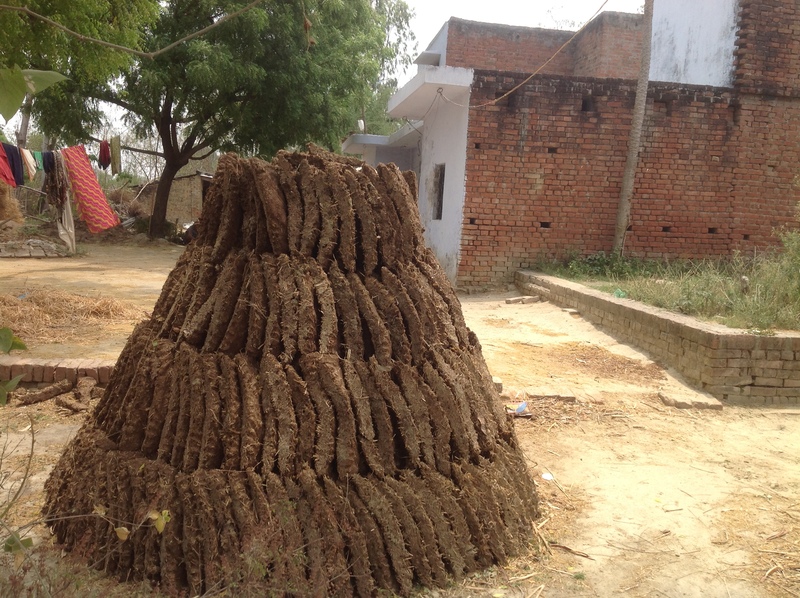 Though it was meant for use by all, village head’s family was giving hard time to the people who came to use it. These villagers had to go a mile to a well to fetch water. These women were so agitated that there was a cacophony of voices, all of them speaking at the same time; on top of that Hindi in Varanasi area is a mix of Hindi and Bhojpuri and more so in villages, so half of what they were saying was going over our heads. We found it difficult to pacify them. One woman was asking for help with her young widowed daughter in law who seemed to be in her early twenties. 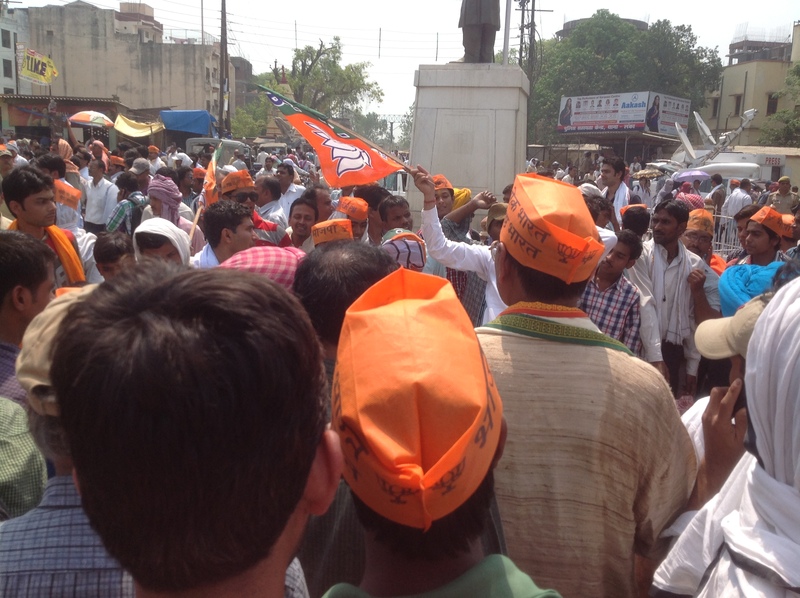 I really felt depressed after this visit, which marked the end of our campaign in Varanasi. All in all, this has been an awesome experience and I learned a lot. 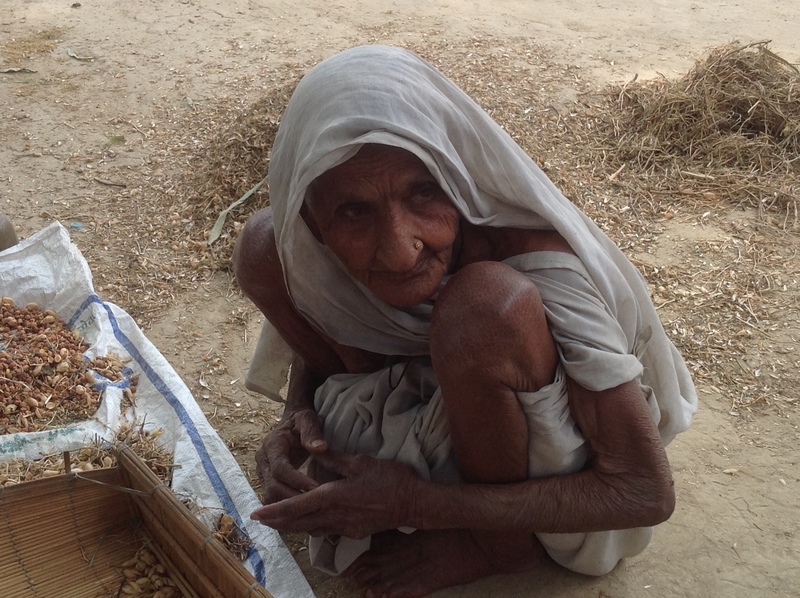 I had come face to face with poor and forgotten Bharat. Since Bharat consists of 70% villages, I can see that the challenges are enormous. I hope Modiji will get support form all quarters to better the lives of these people and give them hope for their future. I must add that we had generous support from some great souls. Dr. Naresh C. Gupta, a successful businessman, whom we in VHP of America (VHPA) have known for decades through his involvement in Ekal Vidyalaya program, had taken upon himself to pay for our guesthouse stay. There were six rooms booked for an average of seven days with each one costing about Rs. 900 per day. He also invited us for dinner more than once. Dr. Bhupendra Kumar Modi, head of Modi conglomerate treated all NRis to a lavish dinner at a four star hotel. Separately, Mrs. Veena Modi invited us for a dinner at Taj hotel. We have known Modis from late 90’s when they were involved with VHPA’s Dharma Prasar Yaatra and United Nation’s Millennium Peace Summit in 2000. Mrs. Modi presented all NRIs with a box of Banaras’s famous sweets.Wherever we went, we were warmly received. Villagers always offered something to eat. They were overwhelmed that some one from as far as America had come to listen to them. In turn we felt deeply connected to them. I hope for an improved future for these villagers, where they would have all the basic necessities of life such as roads, water, electricity, healthcare and education and enough opportunities to make a decent living. May this election be a game changer in that sense. On the last day, we took time out to visit Kashi Vishwanath Mandir and take dip in Gangamaiya at Assi ghat. I will write about it some time in future. We returned to Amdavad on 11th and as I wrote all these reports (now that I have easy access to the Internet and Wi Fi), I have relived the wonderful experience. This was a memorable day. The day before District Magistrate (DM) had refused to give permission for Narendra Modi’s public meeting in Beniyabag, Varanasi, citing security concern (it is a different matter that two days later, same administration allowed Rahul Gandhi’s road show, though he has higher level of security!) Not one to take it lying down and known for turning every adversity in to an opportunity (starting with Maut Ka Sodagar epitaph in 2007 Gujarat election), Narendrabhai canceled all other programs (Ganga Aarati and a meet with intellectuals) except one rally in Rohaniya. 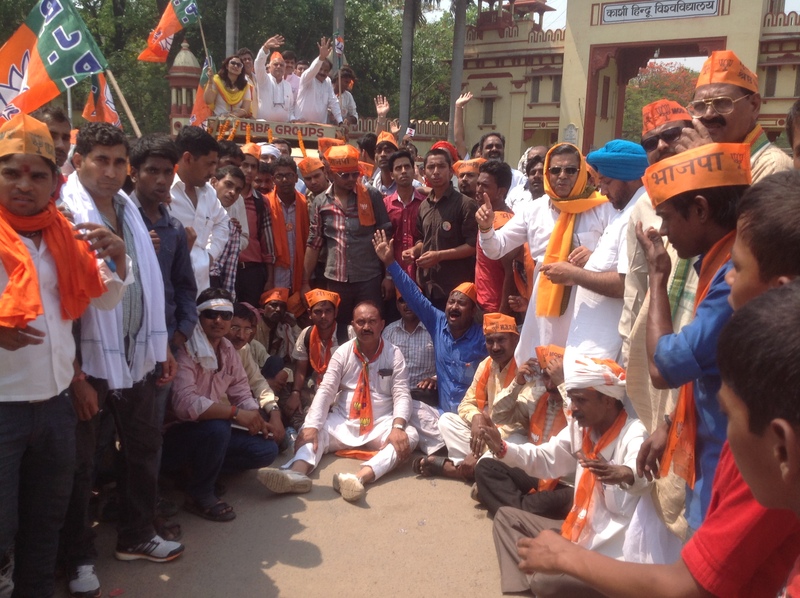 This itself became a rallying point for Modi aficionados, who number in hundreds of thousands here in Varanasi. Modiji converted this into an opportunity to have an unannounced, unofficial roadshow- more about it later. Also it was announced that Amit Shah, Arun Jaitley, Mukhtar Abbas Naqvi and other leaders would sit on a Dharana in Lanka, a famous area in front of Banaras Hindu University (BHU) on 8th morning. Our team under leadership of Ramesh Shah (Houston) decided to halt campaigning and join Dharana to protest prejudiced and politically motivated decision of the EC. 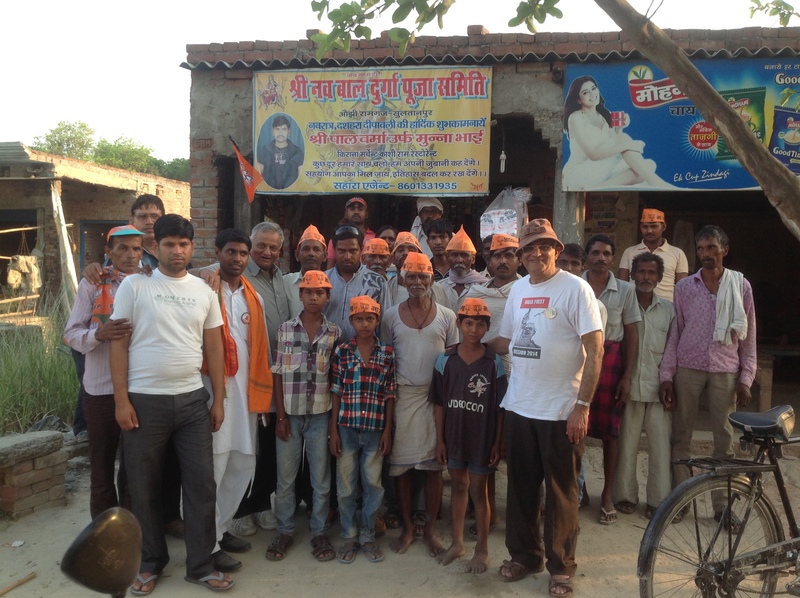 Our first stop was a busy road where we distributed NaMo for PM caps to people passing by. Then we proceeded to BHU campus. This is a huge campus with a big public hospital. Pandit Madanmohan Malaviyaji’s statue graces the gates of the campus. We reached there just before 10:00 AM. BJP leaders were expected at 11:00. There was a big crowd chanting slogans against the election commission and the DM. Trucks with satellite dishes were parked on both sides of the road. All major channels- Aaj Tak, India Times, NDTV, ETV, TV9, etc. were present as were a number of smaller and local channels. Umpteen reporters holding microphone in had with cameraman in tow were working the crowd to get sound bytes. Burkha Dutt, Rahul Kanwal and Anurag Kashyap were moving around. I saw and heard Anurag Kashyap spewing his anti-BJP, anti-Modi venom as his cameraman was recording him. He looked like an angry, frustrated man. A vein on his neck was literally throbbing and I though the guy was going to have a coronary. I had vicarious pleasure knowing that these scoundrels’ days were numbered now. Within an hour crowd was of unmanageable proportion. Police had not stopped or diverted traffic because Dharana is a public right and does not require police permission. Since no permission is sought, there is no legal need to stop the traffic. Hapless people on two wheelers and in cars were struggling to pass through human sea. Air was charged with Modi, Modi chants. Some local leaders were already sitting in the middle of the road for Dharana. Heat was so intense that it felt someone had put hot wires around our bodies. We were constantly downing cold water bottles but that gave only temporary respite. W waited till 12:30 Pm but Jaitleyji and company had not arrived yet. We decided that we were better off going to BJP election office and help with office work there. This we spent two and a half hour in the frenzied environment. 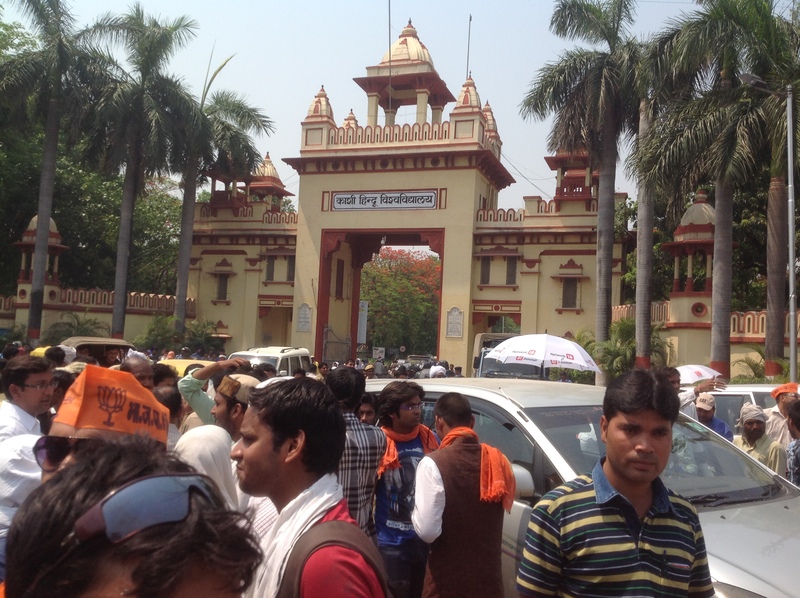 Banaras Hindu University gate where Dharna was scheduled. We had come to know that Modiji was going to come to the election office to do Ganga Pujan straight from his meeting at Rohaniya. I went to a cybercafé to get some work done as there was no Internet/Wi-Fi at the guesthouse where we had stayed (across from BJP election office in Rathyatra in Sigra area.) When I reached the BJP office gates at 5:30 PM, it was a virtual fortress, surrounded by CRP, RAF, police, etc. No one without an approved pass was allowed inside. They had issued passes to local workers, which was quite understandable. Inside also there were people in the compound who were not allowed to go inside the building. There were people in the building on upper floors who were not allowed to come down. Our friend, Ramesh Shah, who was helping with the office work was inside but rest of us were outside. I attempted to reason with the senior volunteer outside and after some persuasion, he allowed me to go inside the compound making it clear that I would not be able to go further, which was OK by me. With me was Meena Shah, a volunteer from Houston and Dr. Anjila Gupta, a professor from Indira Gandhi National Open University, Delhi who had taken one month off to work on campaign in Varanasi. All three of us joined 60 or so people in the large compound. It was a hot day and all we had was water at normal temperature. We kept standing, sometimes finding a stoop to sit on. Modiji was expected around 6:00 PM. But wait was without an end. I did feel drawn out because morning Dharana and now standing on feet in the depressing heat had taken its toll but there was no question of backing out now. There were people in balconies of the building. The office is on the ground floor and this brand new building has 10 floors. We saw Laxmikant Bajpayee, president of BJP-UP, sitting outside. We also saw former CM, Kalyan Singh’s son and many other dignitaries. Modiji had arrived in Lanka (BHU) from Rohaniya by helicopter and from there he was coming in an SUV. He couldn’t stand in the vehicle as it would be against election law (that would be considered an official road show and would need permission, so he was greeting people on the side of the roads with folded hands. Crowd was so intense on his route that it took him five hours to cover a distant of 4 KM (2.5 miles)! Finally his car entered the gates at 9:30 PM. I had waited exactly four hours to have a glimpse of him. As soon as he alighted from the flower bedecked SUV, security threw a cordon around him yet the crowed jostled to be near him. People almost broke the cordon and Modiji had hard time to walk barely 50 steps to heavily guarded front doors. I snapped some photos with iPad but it was impossible to get a clear shot. All you could hear was Modi, Modi, Modi and nothing else. He was hardly inside for 10 minutes where he performed Puja of Gangaji water that was specially brought there; Pandit Chhannuram, who had accompanied when he filed his nomination officiated for the Puja. Anjilabahen asked me if she could get one of the flower “malas” from Modiji’s vehicle. I was not too sure but asked one of the commandos. He OK’ed it so I picked up one mala from the bonnet of SUV and gave it to Anjinibahen, keeping one flower for myself. 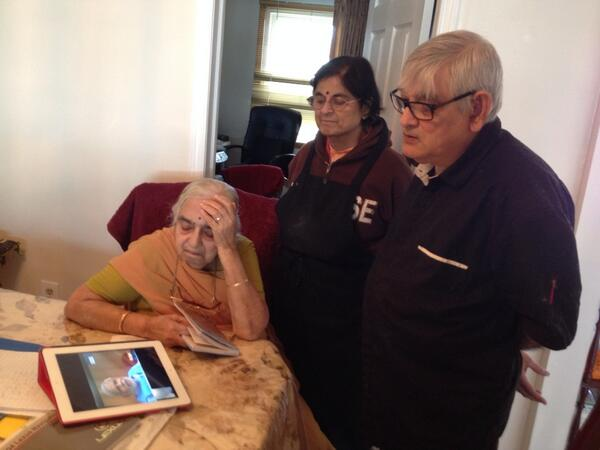 Such is the craze and Bhakti for Modiji, cutting against all barriers of age, position, social status, etc. Very soon Modiji came out; this time the security was better prepared and whisked him into his car and sped off in no time. Within moments it was all over. Modiji turned the rejection by the DM into an opportunity to attract more people than what a public meeting would have achieved. No wonder, all dirty tricks of Congress have failed. This was an exciting, thrilling and exhausting day for all of us. We embarked on the journey to Amethi with excitement. One, we were going to the battleground Royale, where a dynast was being challenged as was never done before and other, we were going to witness development of a constituency, supposedly nurtured by Rahul Gandhi. Amethi lies 120 miles from Varanasi and part of the travel is by national expressway. It still took us more than five hours. Expressway was nowhere near what we are used to in Gujarat and secondary roads were horrendous to say the least. Traffic indiscipline was so terrible that more than once I thought we were going to die in a head-on collision. We were put up with a fairly rich, landlord (Zamindar) type of a joint family of four brothers. House had 22 rooms. They owned about 65 acres farmland and had also other business interests. They were a pro-Congress people but now leaning towards Modiji. We had lively firsthand education about how Rajiv Gandhi built roads and other facilities and nurtured the constituency and how the village was indebted to him. But then in last 20 years, no development or maintenance had occurred. All this learning was under open skies sitting in a large verandah at late night. Sleeping on coats out in the open and waking up to the sweet sounds of dozens of peacocks was a beautiful experience. Our hosts were gracious and exhibited warmth that is still found in villages. At village after village whether we met with groups of people or individuals, they had a litany of woes and we were listening to them helplessly. At one group meeting they brought drinking water in a glass to show us. It looked more like crushed brick mixed in water. Repeatedly the villagers and semi-urban people, educated as well as uneducated told us that no one cared for them. There was a yearning for a change and hope that “ Modi” will change their lot. We met followers of Congress and SAPA, who said that they would vote for Modi because he would bring development. Expectations from Modiji are so high that it scares me to think of the disappointment of these people when they would realize that changes wouldn’t come that fast and that many of the problems are linked to the non-performing local and State governments and not the central Government. Despite all the unrest, my sense was that Rahul would sail through, albeit with a reduced margin. The Bharatiya mindset of groveling at the feet of a dynasty is so deeply etched in the psyche of the people that it is no use blaming only the rulers; people are equally responsible for their own plight. Education of the people and all-round development of impoverished areas by a BJP government is the only answer to end the hold of the dynasty, the Thakurs, the landlord and political mafia. Fortunately, all children go to school (education is a big business everywhere in Bharat) and Ekal Vidyalaya has good penetration in these villages, so hopefully thing would change for better. An interesting thing I noticed was the custom that wherever one went, before the customary offer of a glass of water, the host will offer something to eat. It may be as simple as a piece of jaggery (deliciously sweet, since this is made in the farm from sugarcane without any additives or refinement), a biscuit or a cracker or sweets and snacks. Initially, I had refused the offer but once I came to know of the custom, I never said no. We drank all kind of waters at every place we went over these 10 days and we had no problem whatsoever; I attribute it to God’s grace. I was surprised that we were in one piece after the grueling journey on unending potholes for miles and miles but there was a sense of satisfaction that we were doing our bit for our beloved matrubhumi. BBC covered the efforts of Indian diaspora in supporting NaMo & they have acknowledged that looking at America’s reaction it appears the results are out & NaMo is the PM. We wish all a very happy Gregorian New Year, 2014. Let this year see total wipe out of Congress party from the electoral map. Let thinking citizens of Bharat give clear majority to BJP, so that Shree Narendra Modi can be elected as an effective Prime Minister and can usher in good governance without constraints of coalition politics. A decisive nationalist leader, who inspires others to give their 110% and who brooks no nonsense is the need of the hour; only Narendra Modi fits that bill today. This is not the time to tinker with alternatives that are willing to give away Kashmir, hobnob with Maoist terrorists and have sympathy for terrorist killed in Batla encounter. Yes, perhaps, this new breed can give good governance, though it is highly doubtful looking to their \”freebies\” culture, but can we barter away national security for such freebies? That is the only question every voter has to ask herself. Let us all rededicate ourselves today to spend every available moment to campaign for Narendra Modi and his party, BJP. Let NRIs call their contacts in Bharat, send email, write letters, use social media such as Facebook, Twitter, Instagram, Pinterest, Quora, etc. to bring awareness in the society at this very critical juncture in the history of Bharat, that is, India. Let us make sure that the maximum number of people register to vote and decide to vote for BJP, since that is the only way Narendra Modi can become the Prime Minister of India. . Let us concentrate on new voters, especially youth. Sitting outside of Bharat, we can do much more but let us concentrate on people to people contacts for now. It does not matter whether you are in USA, Canada, UK, Germany, Australia, Dubai, Singapore or Hong Kong; start working now without waiting for instructions. Visit www.gibv.org and register yourself as a volunteer to leave a mark in the history. 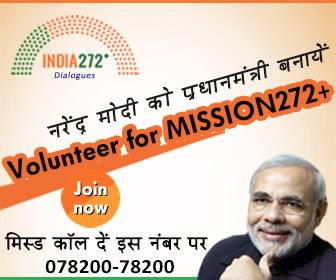 If you live in Bharat, then do also visit and register on < http://www.india272.com/>. Happy New Year and Jay Hind! Bangalore, July 14: The manner in which the media has twisted Narendra Modi’s comments in a recent interview to Reuters are a good example of how Media creates controversies around Narendra Modi and then goes on milk those controversies for weeks to generate traffic, eyeballs and TRPs. The media reporting on Narendra Modi’s visit to Uttarakhand last month was no different when that visit was turned into a controversy for weeks thanks to a report in the Times of India on 23rd June. It now turns out that the Times of India report of 23rd June attributing claims to Narendra Modi was a false and mischevious report. The Times of India has now belatedly issued a lame clarification almost 3 weeks after the fact. The Times of India clarification has appeared today as a small insert in an inner page in one of its local editions. In the clarification the Times of India admits to its mistake and also admits that its mistake created a huge controversy for Narendra Modi for no fault of Mr Modi. 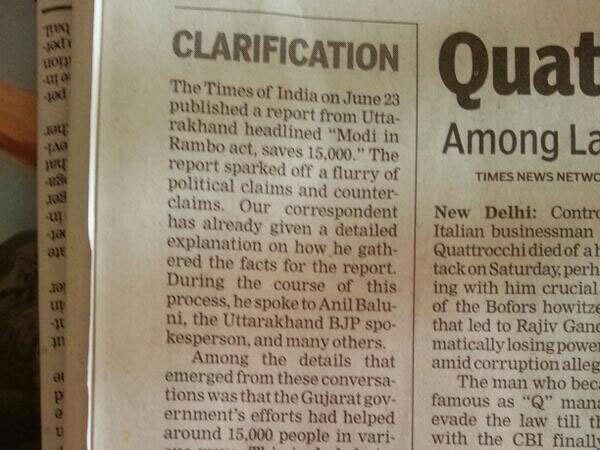 The clarification also admits that all the exaggeration in that report was due to Times of India. The clarification makes it clear that neither did Narendra Modi, nor did the Gujarat Government have anything to do with the mischevious report. It is shocking that the Times of India filed such an irresponsible report without checking with Narendra Modi or Government of Gujarat. It is also mischevious that the Times of India milked the controversy for so many weeks by allowing the Congress Party and other anti-Modi elements to take advantage of this report to write slanderous and defamatory columns as well as run a motivated campaign in Social Media. This lame excuse by Times of India coming 3 weeks after the damage was done is a case of doing too little too late. The most important thing before we begin is to call things by their proper name. One, our clever-by-half media and secularati have twisted the retraction of Wharton School India Economic Forum’s invitation to Narendra Modi as a “snub.” Two, it was Wharton that had invited Modi. Modi hadn’t sought it out. American stalwart institutions giving up our most basic freedom to Islamic supremacists, goons and thugs….The loss of our most basic freedoms without firing a shot is stunning. Wharton’s fault is not so much as cancelling Modi’s invitation but cancelling it in the face of bullying tactics by a handful of fascist bigots that includes both professors and students. With this, Wharton has accomplished two things together: it has demonstrated that it’s no longer a stalwart institution, and it has violated the spirit of the American First Amendment. Rajiv Malhotra’s point is closer home, and a deeper examination of the folks and forces who orchestrated the invitation-revocation reveals disturbing things. The first point is that the Government of India is a sponsor to this event. As we note, the Government hasn’t uttered a single word of condemnation against the band of bigots who got Modi’s invitation revoked. As a Constitutionally-elected (thrice) Chief Minister, it becomes the Government’s responsibility to refuse to kowtow to this ragtag group of muckrakers. Whatever the ruling party’s politics at home, it should realize a basic fact when abroad: it needs to strongly condemn people of other countries who try to dictate who gets invited or whose invite gets cancelled. And when such a thing occurs, it needs to unilaterally withdraw from the event on moral grounds. As we see, it hasn’t done so. Why? The simple answer: the current dispensation doesn’t mind being held hostage to a group of virulent Narendra Modi-haters even if it means India’s image abroad takes a beating. The longer answer lies precisely in the composition and agenda of these Professor-Sepoys. But first, here’s the Facebook group that lists more than 900 people who wanted—and got—the cancellation of Modi’s invitation. What also unites these folks is the fact a whole lot of them supported mercy petitions for the Indian Parliament attack mastermind Afzal Guru, and the Pakistani terrorist Ajmal Kasab who mowed down innocent Indians in cold blood on 26/11/2008 in Mumbai. Ania Loomba and Suvir Kaul—Professors of English at University of Pennsylvania, they were two of the three professors who kickstarted this free-speech-violating petition. Toorjo Ghosh—Assistant Professor of English, the third kickstarter. Here’s how he gloats about the cancellation: “It is the result of the pressure that we were able to bring over the organisers… in the last two days. I am very very proud of Wharton as well as the Penn University.” In other words, he’s proud that Wharton and Penn acquiescence in choking free speech and democracy. Shabnam Hashmi—No surprises here. Owner of the highly communal NGO named ANHAD, she’s been one of the key players in the Gujarat Riots Cottage Industry, and continues to be highly active in demonizing Narendra Modi. TV18—A sponsor of the IEF. This is the same group that owns the news channel CNN-IBN, headed by Rajdeep Sardesai, a known Modi-baiter. He was also caught with his pants down in that shameful Cash for Votes scandal of 2008. Adani Group—Another sponsor, which withdrew after Modi’s invite was cancelled. our goal as a team is to provide a neutral platform to encourage cross pollination of ideas as we all work towards contributing to India’s success…We do not endorse any political views and do not support any specific ideology. I suppose the neutral and “not endors(ing) any political views” part doesn’t apply to Union Minister Milind Deora. The strident opposition to Narendra Modi stems from two reasons. The first is the obvious desire to push a Leftist agenda that thrives on India-baiting. The second is the string of successes that Narendra Modi has recently achieved beginning with his third consecutive, thumping electoral victory and his massive show-stealer at the BJP National Council in Delhi yesterday. These have decisively set the stage for a larger role in national politics. Except a few motivated folks, nobody has really been able to dispute his stupendous Gujarat Development Story that has consistently delivered quality governance and economic development. This precisely is the fear of the fascist professors and other fellow travellers: a scenario in which Narendra Modi had spoken at Wharton. There’s little doubt that he’d be the undisputed giant in that assemblage of the aforementioned pygmies who simply cannot think beyond spurious secularism and socialist platitudes. Indeed, that cancellation note explicitly records all these achievements of Modi. Equally, the fact that the fascist pressure group was led by Left academics is also consistent with their decade-long record of Modi-baiting. It’s both symbolic and symptomatic of the rot that pervades almost all humanities departments in universities worldwide. These Left-infiltrated universities actively discourage critical thinking by substituting reason with theory and rhetoric. Be it the Jaipur Literary Festival or the current disgrace at Wharton, we see the same or familiar faces. What business does Javed Akhtar and Shabana Azmi have in a Business School? And why were they even invited? Which exposes—yet again—another facet common to events where the Left is involved: preying on taxpayer money. But what’s clear is this: Wharton and indeed, UPenn itself has scored a massive self-goal by giving in to these Left Professors’ bullying tactics. A goldmine of a sponsor like Adani has pulled out. The former Union Minister, Suresh Prabhu has pulled out. And they haven’t taken this lightly. The social media world began to slam Wharton almost as soon as news of the invite cancellation was reported, and the slamming torrent hasn’t abated. More importantly, Narendra Modi doesn’t need Wharton. Curiously enough, not a single professor from the Wharton School, one of the most prestigious business schools of the US, which is part of the University of Pennsylvania, was a signatory to this letter.